For Glasgow head teacher Tom McDonald David Blunkett's talk of the danger of schools' being "swamped" by refugees is far from reality. He believes the whole school and the local community have benefited from the arrival of 62 refugee children in the past few years. The Catholic All Saints secondary school began taking in asylum-seekers two years ago when Glasgow became part of the government's plan to disperse refugees across the UK. Mr McDonald says the benefits have been for the refugee children themselves, in finding some stability and a safe place to learn, but also for the local pupils. "Among the refugee children, there is a great eagerness to learn and respect for education which in some cases has rubbed off on the indigenous population," he told BBC News Online. The newcomers, he says, are given intensive help to learn English but are integrated into mainstream schooling as quickly as possible. Mr McDonald says the local pupils, who often come from disadvantaged backgrounds, can learn from the new arrivals who may have suffered even more. And there have also been benefits which are obvious to youngest school children. 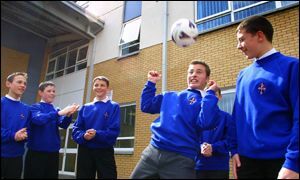 One new arrival, an asylum-seeker from Macedonia, has become a school hero after scoring a hat-trick for the football team last weekend. The win put All Saints in the final of the Glasgow schools championships for the first time. Elis, 13, arrived in the school three months ago. He travelled to Britain on his own after his mother put him on a bus, and he has not seen her since. He is pleased he gets on well with the other children and says he is happy at the school. It is a feeling shared by 18-year-old Quadish, who arrived at the school 18 months ago from Pakistan. He hopes to follow a career in business or banking when he leaves school and plays cricket for a Glasgow team. "It was strange coming here at first, with the different culture. "I was quite nervous," he said. "But it is quite a nice school, with nice pupils and hard-working teachers. I haven't had any problems here." Heather Doyle is one of four teachers who work in the school's new multi-lingual unit, helping the refugees with their English and sometimes sitting in on classes with them. "It's a very rewarding job," she said. "The children are hard-working and want to take the opportunities they have. "They have often been through traumatic experiences so we work to build up their self-esteem." Head teacher Tom McDonald believes the inclusion of the newcomers in the Roman Catholic school will be very good for promoting racial harmony. "Their experiences can open the minds of the other children and help combat issues such as racism and intolerance," he said. The refugees at the school come from a total of 24 countries and include several girls who fled Afghanistan, where they were banned from attending school. Mr McDonald says politicians who are anxious about the effect of refugees on a community should come to Glasgow to see how well the local authority and the schools have managed. "Integration is not without its trials and tribulations, but overall, it has been very good for everyone," he said.